New Shepard is a vertical-takeoff, vertical-landing (VTVL), suborbital crewed rocket that is being developed by Blue Origin as a commercial system for suborbital space tourism. Blue Origin is owned and led by Amazon.com founder and businessman Jeff Bezos and aerospace engineer Rob Meyerson. NASA Silver Snoopy Award winner Robert Smith is the company's chief executive officer. The name New Shepard makes reference to the first American astronaut in space, Alan Shepard, one of the original NASA Mercury Seven astronauts, who ascended to space on a suborbital trajectory similar to that planned for New Shepard. Prototype engine and vehicle flights began in 2006, while full-scale engine development started in the early 2010s and was complete by 2015. Uncrewed flight testing of the complete New Shepard vehicle (propulsion module and space capsule) began in 2015. On 23 November 2015, after reaching 100.5 km (62.4 mi) altitude (outer space), the New Shepard booster successfully performed a powered vertical soft landing, the first time a booster rocket had returned from space to make a successful vertical landing. The test program continued in 2016 and 2017 with four additional test flights made with the same vehicle (NS2) in 2016 and the first test flight of the new NS3 vehicle made in 2017. Blue Origin is planning the first crewed test flight to occur in 2019, and has announced that tickets would begin to be sold for commercial flights. The first development vehicle of the New Shepard development program was a sub-scale demonstration vehicle named Goddard, built in 2006 following earlier engine development efforts by Blue Origin. Goddard made its first flight on 13 November 2006. The Goddard launch vehicle was assembled at the Blue Origin facility near Seattle, Washington. Also in 2006, Blue Origin started the process to build an aerospace testing and operations center on a portion of the Corn Ranch, a 165,000-acre (668 km2) land parcel Bezos purchased 40 kilometers (25 mi) north of Van Horn, Texas. Blue Origin Project Manager Rob Meyerson has said that they selected Texas as the launch site particularly because of the state's historical connections to the aerospace industry, although that industry is not located near the planned launch site, and the vehicle will not be manufactured in Texas. On the path to developing New Shepard, a crew capsule was also needed, and design was begun on a space capsule in the early 2000s. One development milestone along the way became public. On 19 October 2012, Blue Origin conducted a successful Pad Escape a full-scale suborbital Crew Capsule at its West Texas launch site. For the test, the capsule fired its pusher escape motor and launched from a launch vehicle simulator. The Crew Capsule traveled to an altitude of 2,307 ft (703 m) under active thrust vector control before descending safely by parachute to a soft landing 1,630 ft (500 m) downrange. In April 2015, Blue Origin announced that they had completed acceptance testing of the BE-3 engine that would power the larger New Shepard vehicle. Blue also announced that they intended to begin flight testing of the New Shepard later in 2015, with initial flights occurring as frequently as monthly, with "a series of dozens of flights over the extent of the suborbital test program [taking] a couple of years to complete." The same month, the FAA announced that the regulatory paperwork for the test program had already been filed and approved, and test flights were expected to begin before mid-May 2015. By February 2016, three New Shepard vehicles had been built. The first was lost in a test in April 2015, the second had flown twice (see below), and the third was completing manufacture at the Blue factory in Kent, Washington. A multi-year program of flight tests was begun in 2015 and is continuing in 2018. By mid-2016, the test program was sufficiently advanced that Blue Origin has begun flying suborbital research payloads for universities and NASA. 19 June 2016 New Shepard 2 ♺ Success Sub-orbital spaceflight and landing of a reused booster: The fourth launch and landing of the same rocket. Blue Origin published a live webcast of the takeoff and landing. 5 October 2016 New Shepard 2 ♺ Success Sub-orbital spaceflight and landing of a reused booster. Successful test of the in-flight abort system. The fifth and final launch and landing of the same rocket (NS2). 12 December 2017 New Shepard 3 Success Flight to just under 100 km and landing. The first launch of NS3 and a new Crew Capsule 2.0. 29 April 2018 New Shepard 3 ♺ Success Sub-orbital spaceflight and landing of a reused booster. Apogee 351,000 feet (approx 107 km). 18 July 2018 New Shepard 3 ♺ Success Sub-orbital spaceflight and landing of a reused booster, with the Crew Capsule 2.0-1 RSS H.G.Wells, carrying a mannequin. Successful test of the in-flight abort system at high altitude. Apogee 389,846 feet (73.8 mi; 119 km), duration 11 minutes. The first flight of the full-scale New Shepard vehicle—NS1—was conducted on 29 April 2015 during which an altitude of 93.5 km (307,000 ft) was attained. While the test flight itself was deemed a success, and the capsule was successfully recovered via parachute landing, the booster stage crashed on landing and was not recovered due to a failure of hydraulic pressure in the vehicle control system during the descent. The New Shepard 2, or NS2, flight test article propulsion module made five successful flights in 2015 and 2016, being retired after its fifth flight in October 2016. After the loss of NS1, a second New Shepard vehicle was built, NS2. Its first flight, and the second test flight of New Shepard overall, was carried out on 23 November 2015, reaching 100.5 km (330,000 ft) altitude with successful recovery of both capsule and booster stage. The booster rocket successfully performed a powered vertical landing. This was the first such successful rocket vertical landing on Earth after travelling higher than 3,140 m (10,300 ft) that the McDonnell Douglas DC-XA achieved in the 1990s, and first after sending something into space. Jeff Bezos was quoted as saying that Blue Origin planned to use the same architecture of New Shepard for the booster stage of their orbital vehicle. On 22 January 2016, Blue Origin successfully repeated the flight profile of 23 November 2015 launch with the same New Shepard vehicle. New Shepard launched, reached a maximum altitude of 101.7 km (63.2 mi), and, after separation, both capsule and launch vehicle returned to the ground intact. This accomplishment demonstrated re-usability of New Shepard and a turnaround time of 61 days. On 2 April 2016, the same New Shepard booster flew for a third time, reaching 339,178 feet (103.8 km), before returning successfully. On 19 June 2016, the same New Shepard booster flew, now for a fourth time, again reaching over 330,000 feet (100.6km), before returning successfully for a VTVL rocket-powered landing. The capsule returned once again under parachutes but, this time, did a test descent with only two parachutes before finishing with a brief pulse of retro rocket propulsion to slow the ground impact velocity to 4.8 km/h (3 mph). The two parachutes "slowed the descent to 23 mph, as opposed to the usual 16 mph with three parachutes". Crushable bumpers are used to further reduce the landing shock through energy-absorbing deformation. A fifth and final test flight of the NS2 propulsion module was conducted on 5 October 2016. The principal objective was to boost the passenger module to the point of highest dynamic pressure at transonic velocity and conduct a flight test of the in-flight abort system. Due to subsequent buffet and forces that impact the propulsion module after the high-velocity separation of the passenger capsule that are outside the design region of the PM, NS2 was not expected to survive and land, and if it did, Blue had stated that NS2 would be retired and become a museum item. In the event, the flight test was successful. The abort occurred, and NS2 remained stable after the capsule abort test, completed its ascent to space, and successfully landed for a fifth and final time. New Shepard 3 (NS3) was modified for increased reusability and improved thermal protection; it includes a redesigned propulsion module and the inclusion of new access panels for more rapid servicing and improved thermal protection. NS3 is the third propulsion module built. It was completed and shipped to the launch site by September 2017, although parts of it had been built as early as March 2016. Flight tests began in 2017 and continued into 2019. The new Crew Capsule 2.0, featuring windows, is integrated to the NS3. . NS3 will only ever be used to fly cargo; no passengers will be carried. Its initial flight test occurred on 12 December 2017. This was the first flight flown under the regulatory regime of a launch license granted by the US Federal Aviation Administration. Previous test flights had flown under an experimental permit, which did not allow Blue to carry cargo for which it is paid for commercially. This made the flight of NS3 the first revenue flight for payloads, and it carried 12 experiments on the flight, as well as a test dummy given the moniker "Mannequin Skywalker." Since the maiden flight, "Blue Origin has been making updates to the vehicle ... intended primarily to improve operability rather than performance or reliability. Those upgrades took longer than expected" leading to a several-month gap in test flights. The second test flight took place on 29 April 2018. The 10th overall New Shepard flight, and the fourth NS4 flight, had originally been planned for December 2018, but was delayed due to "ground infrastructure issues." Following a diagnostics of the initial issue, Blue rescheduled the launch for early 2019, after discovering "additional systems" that needed repairs as well. The flight launched on 23 January 2019 and successfully flew to space with a maximum altitude of 106.9 km. New Shepard 4 (NS4)—the fourth propulsion module to be built—will be the first one to actually carry passengers. The vehicle was manufactured in 2018 and moved to the Texas Blue Origin West Texas launch facility by December. Blue stated that they expect it to fly the first human test-passenger to space in 2019. Additional vehicles are under construction. An initial build order of six vehicles was planned, each one taking 9 to 12 months to construct. After the initial build, and after completing an extensive test flight program, Blue Origin intends to "let the demand for space tourism and research determine how many additional vehicles may be needed." For many years, Blue did not make public statements about the date of the start of commercial flights of New Shepard. This changed in June 2018 when the company announced that while it continued to plan to fly initial internal passengers later in 2018, it would not be selling commercial tickets for New Shepard until 2019. The New Shepard is a fully reusable, vertical takeoff, vertical landing (VTVL) space vehicle composed of two principal parts: a pressurized crew capsule and a booster rocket that Blue Origin calls a propulsion module. The New Shepard is controlled entirely by on-board computers, without ground control or a human pilot. The New Shepard propulsion module is powered using a Blue Origin BE-3 bipropellant rocket engine burning liquid hydrogen and liquid oxygen, although some early development work was done by Blue Origin on engines operating with other propellants: the BE-1 engine using monopropellant hydrogen peroxide; and the BE-2 engine using high-test peroxide oxidizer and RP-1 kerosene fuel. The New Shepard is launched vertically from West Texas and then performs a powered flight for about 110 s and to an altitude of 40 km (130,000 ft). The craft's momentum carries it upward in unpowered flight as the vehicle slows, culminating at an altitude of about 100 km (330,000 ft). After reaching apogee the vehicle would perform a descent and restart its main engines a few tens of seconds before vertical landing, close to its launch site. The total mission duration is planned to be 10 minutes. The crewed variant would feature a separate crew module that could separate close to peak altitude, and the propulsion module would perform a powered landing while the crew module would land under parachutes. The crew module can also separate in case of vehicle malfunction or other emergency using solid propellant separation boosters and perform a parachute landing. New Shepard is in the midst of a test program. Uncrewed flights began in 2015 and continue into 2018. Blue Origin has plans to test the vehicle with "test passengers" for the first time in 2018, and commercial flights are slated to begin shortly after. Initial low altitude flight testing (up to 600 m) with subscale prototypes of the New Shepard was scheduled for the fourth quarter of 2006. This was later confirmed to have occurred in November 2006 in a press release by Blue Origin. The prototype flight test program could involve up to ten flights. Incremental flight testing to 100 km altitude was planned to be carried out between 2007 and 2009 with increasingly larger and more capable prototypes. The full-scale vehicle was initially expected to be operational for revenue service as early as 2010, though that goal was not met and the first full-scale test flight of a New Shepard vehicle was successfully completed 2015, with commercial service currently aimed for no earlier than 2018. The vehicle could fly up to 50 times a year. Clearance from the FAA was needed before test flights began, and a separate license is needed before commercial operations begin. Blue held a public meeting on 15 June 2006 in Van Horn, as part of the public comment opportunity needed to secure FAA permissions. Blue Origin projected in 2006 that once cleared for commercial operation, they would expect to conduct a maximum rate of 52 launches per year from West Texas. The RLV would carry three or more passengers per operation. An initial flight test of a prototype vehicle took place on 13 November 2006 at 6:30 am local time (12:30 UTC); an earlier flight on the 10th being canceled due to winds. This marked the first developmental test flight undertaken by Blue Origin. The flight was by the first prototype vehicle, known as Goddard. The flight to 285 feet (87 m) in altitude was successful. Videos are available on the Blue Origin website and elsewhere. A second test vehicle[clarification needed] made two flights in 2011. The first flight was a short hop (low altitude, VTVL takeoff and landing mission) flown in approximately early June. The vehicle is known only as "PM2" as of August 2011, gleaned from information the company filed with the FAA prior to its late August high-altitude, high-velocity second test flight. Media have speculated this might mean "Propulsion Module". The second test vehicle was flown a second time on a 24 August 2011 test flight, in west Texas. It failed when ground personnel lost contact and control of the vehicle. The company recovered remnants of the space craft from ground search. 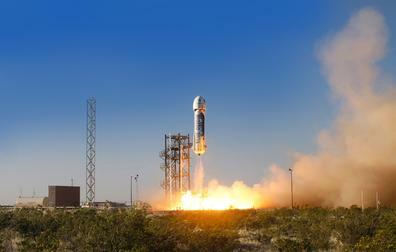 On 2 September 2011, Blue Origin released the results of the cause of the test vehicle failure. As the vehicle reached Mach 1.2 and 45,000 feet (14,000 m) altitude, a "flight instability drove an angle of attack that triggered [the] range safety system to terminate thrust on the vehicle." Additionally, Blue Origin received US$3.7 million in CCDev phase 1 to advance several development objectives of its innovative 'pusher' Launch Abort System (LAS) and composite pressure vessel As of February 2011[update], with the end of the second ground test, Blue Origin completed all work envisioned under the phase 1 contract for the pusher escape system. They also "completed work on the other aspect of its award, risk reduction work on a composite pressure vessel" for the vehicle. Following the fifth and final test flight of the NS2 booster and test capsule in October 2016, Blue Origin indicated that they were on track for flying test astronauts by the end of 2017, and beginning commercial suborbital passenger flights in 2018. In the event, Blue made no passenger flights in 2017, and in December 2017, stated they remained "about a year away from starting to fly people." As of March 2011[update], Blue Origin had submitted the New Shepard reusable launch vehicle for use as an uncrewed rocket for NASA's suborbital reusable launch vehicle (sRLV) solicitation under NASA's Flight Opportunities Program. Blue Origin projects 100 km (330,000 ft) altitude in flights of approximately ten minutes duration, while carrying an 11.3 kg (25 lb) research payload. By March 2016, Blue noted that they are "due to start flying unaccompanied scientific payloads later [in 2016]." ^ Doug Mohney (7 May 2015). "Will Jeff Bezos Speed Past Virgin Galactic to Tourist Space?". TechZone360. ^ Jonathan Amos (30 April 2015). "Jeff Bezos conducts New Shepard flight". BBC News. ^ a b c d Foust, Jeff (13 April 2015). "Blue Origin's suborbital plans are finally ready for flight". Retrieved 18 April 2015. We’ve recently completed acceptance testing, meaning we’ve accepted the engine for suborbital flight on our New Shepard vehicle, [the end of a] very, very long development program [of] 450 test firings of the engine and a cumulative run time of more than 500 minutes. The completion of those tests sets the stage for Blue Origin to begin test flights of the vehicle later this year at its facility in West Texas [where they] expect a series of flight tests with this vehicle ... flying in autonomous mode.... We expect a series of dozens of flights over the extent of the test program [taking] a couple of years to complete. ^ a b "Blue Origin Makes Historic Rocket Landing". Blue Origin. 24 November 2015. Archived from the original on 25 November 2015. Retrieved 24 November 2015. ^ a b c Amos, Jonathan (24 November 2015). "New Shepard: Bezos claims success on second spaceship flight". BBC News. Retrieved 26 November 2015. ^ a b "Blue Origin plans next New Shepard test for October – SpaceNews.com". 8 September 2016. ^ a b "Jeff Bezos says Blue Origin gives test dummy 'a great ride' on New Shepard suborbital spaceship". GeekWire. 13 December 2017. Retrieved 23 December 2017. ^ . Chris Bergin, Spaceflight.com. 28 November 2018. ^ a b c d Foust, Jeff (19 April 2018). "Blue Origin expects BE-4 qualification tests to be done by year's end". SpaceNews. Retrieved 21 April 2018. ^ a b Foust, Jeff (21 June 2018). "Blue Origin plans to start selling suborbital spaceflight tickets next year". SpaceNews. Retrieved 25 June 2018. ^ a b "Blue Origin Flight Test Update". SpaceFellowship.com. 2 January 2007. Our first objective is developing New Shepard, a vertical take-off, vertical-landing vehicle designed to take a small number of astronauts on a sub-orbital journey into space. On the morning of November 13, 2006, we launched and landed Goddard – a first development vehicle in the New Shepard program. ^ Boyle, Alan (13 January 2006). "Amazon founder unveils space center plans". MSNBC. Retrieved 28 June 2006. ^ a b c d David, Leonard (15 June 2006). "Public Meeting Details Blue Origin Rocket Plans". Space.com. Retrieved 10 March 2016. ^ Foust, Jeff (21 April 2015). "Blue Origin To Begin Test Flights Within Weeks". Space news. Retrieved 22 April 2015. ^ a b c d Boyle, Alan (5 March 2016). "Jeff Bezos lifts curtain on Blue Origin rocket factory, lays out grand plan for space travel that spans hundreds of years". GeekWire. Retrieved 10 March 2016. ^ David, Leonard (12 August 2016). "Blue Origin's Sweet Spot: An Untapped Suborbital Market for Private Spaceflight". Space.com. Retrieved 14 August 2016. ^ Harwood, Bill (30 April 2015). "Bezos' Blue Origin completes first test flight of 'New Shepard' spacecraft". Spaceflight Now via CBS News. Retrieved 11 May 2015. ^ Pasztor, Andy (24 November 2015). "Jeff Bezos's Blue Origin Succeeds in Landing Spent Rocket Back on Earth". Wall Street Journal. Retrieved 24 November 2015. ^ "Launch. Land. Repeat". Archived from the original on 24 January 2016. Retrieved 23 January 2016. ^ a b Calandrelli, Emily (2 April 2016). "Blue Origin launches and lands the same rocket for a third time". Retrieved 3 April 2016. ^ Boyle, Alan (19 June 2016). "Jeff Bezos' Blue Origin live-streams its spaceship's risky test flight". GeekWire. Retrieved 21 June 2016. ^ a b c Foust, Jeff (5 October 2016). "lue Origin successfully tests New Shepard abort system". SpaceNews. Retrieved 5 October 2016. ^ Marcia Dunn (19 July 2018). "Jeff Bezos' Blue Origin launches spacecraft higher than ever". Associated Press. Retrieved 19 July 2018. ^ Clark, Stephen. "Blue Origin reschedules New Shepard launch for Wednesday – Spaceflight Now". Retrieved 23 January 2019. ^ "Blue Origin New Shepard: Mission 10 (Q1 2019) - collectSPACE: Messages". www.collectspace.com. Retrieved 23 January 2019. ^ a b New Shepard makes 10th launch as Blue Origin aims to fly humans late in 2019. Eric Berger, Ars Technica. 23 January 2019, accessed 26 January 2019. ^ a b c Berger, Eric (9 March 2016). "Behind the curtain: Ars goes inside Blue Origin's secretive rocket factory". Ars Technica. Retrieved 9 March 2016. ^ Bezos, Jeff (27 April 2015). "First Developmental Test Flight of New Shepard". Blue Origin. Archived from the original on 30 April 2015. Retrieved 27 April 2015. ^ a b Foust, Jeff (30 April 2015). "Blue Origin's New Shepard Vehicle Makes First Test Flight". Space News. Retrieved 1 May 2015. ^ Foust, Jeff (23 January 2016). "Blue Origin reflies New Shepard suborbital vehicle". SpaceNews. Retrieved 24 January 2016. ^ Berger, Brian (23 January 2016). "Launch. Land. Repeat: Blue Origin posts video of New Shepard's Friday flight". SpaceNews. Retrieved 24 January 2016. ^ Grush, Loren (19 June 2016). "Blue Origin safely launches and lands the New Shepard rocket for a fourth time". Retrieved 19 June 2016. ^ Boyle, Alan (20 July 2016). "Jeff Bezos touts results from Blue Origin spaceship's test, even with one less chute". GeekWire. Retrieved 20 July 2016. ^ a b Blue Origin enlarges New Glenn’s payload fairing, preparing to debut upgraded New Shepard, Caleb Henry, SpaceNews, accessed 15 September 2017. ^ a b first time we’ve had two rockets in the barn in West Texas, Blue Origin, 17 December 2018, accessed 26 December 2019. ^ a b Foust, Jeff (19 December 2017). "Blue Origin a year away from crewed New Shepard flights". SpaceNews. Retrieved 22 January 2018. ^ Bartels, Meghan (20 December 2019). "Blue Origin Delays Next New Shepard Launch to Early 2019". Space.com. Retrieved 26 January 2019. ^ a b Foust, Jeff (5 March 2016). "Blue Origin plans growth spurt this year". SpaceNews. Retrieved 9 March 2016. ^ "Our Approach to Technology". Blue Origin. Blue Origin. Archived from the original on 10 January 2018. Retrieved 1 May 2015. The system consists of a pressurized capsule atop a booster. The combined vehicles launch vertically, accelerating for approximately two and a half minutes, before the engine cuts off. The capsule then separates from the booster to coast quietly into space. After a few minutes of free fall, the booster performs an autonomously controlled rocket-powered vertical landing, while the capsule lands softly under parachutes, both ready to be used again. Reusability allows us to fly the system again and again. ... The New Shepard capsule’s interior is ... 530 cubic feet—offering over 10 times the room Alan Shepard had on his Mercury flight. It seats six astronauts. Three independent parachutes [on the capsule] provide redundancy, while a retro-thrust system further cushions [the] landing. ... Full-envelope escape [system] is built around a solid rocket motor that provides 70,000 lb. of thrust in a two-second burn. ^ Blue Origin, "Our Approach to Technology" Archived 10 January 2018 at the Wayback Machine. Retrieved 24 November 2015. ^ Morring, Frank Jr., "Blue Origin Developing Its Own Launch Vehicle", Aerospace Daily & Defense Report, 30 April 2012. Retrieved 24 November 2015. ^ David, Leonard (13 June 2005). "Blue Origin: Rocket plans spotlighted". Space.com. Retrieved 28 June 2006. ^ Sigurd De Keyser (14 November 2006). "Blue Origin: Launches test rocket". spacefellowship.com. Retrieved 15 October 2016. ^ AP (14 November 2006). "Private Texas spaceport launches test rocket". eastlandspin.com. Retrieved 15 October 2016. ^ AP (14 November 2006). "Amazon Founder's Private Spaceport Launches First Rocket". foxnews.com. Retrieved 17 October 2016. ^ a b c Bezos, Jeff (2 September 2011). "Successful Short Hop, Set Back, and Next Vehicle". Letter. Blue Origin. Archived from the original on 2 September 2011. Retrieved 3 September 2011. ^ "Blue Origin has a bad day (and so do some of the media)". NewSpace Journal. 2 September 2011. Retrieved 4 September 2011. ^ "Bezos-Funded Spaceship Misfires". Wall Street Journal. 2 September 2011. Retrieved 3 September 2011. ^ Jeff Foust. "Blue Origin proposes orbital vehicle". Newspacejournal.com. Retrieved 23 April 2015. ^ "CCDev awardees one year later: where are they now?". NewSpace Journal. 4 February 2011. Archived from the original on 5 June 2013. Retrieved 5 February 2011. ^ Foust, Jeff (14 October 2016). "Blue Origin on track for human suborbital test flights in 2017". SpaceNews. Retrieved 15 October 2016. We’re still on track to flying people, our test astronauts, by the end of 2017, and then starting commercial flights in 2018. New Shepard space vehicle first successful soft landing, 23 November 2015 (YouTube). This page was last edited on 20 April 2019, at 18:22 (UTC).